It was once believed that it was impossible to regain sight once it was lost. Although that may be true if the eyes or optical nerve are injured, researchers have demonstrated that some degree of sight can be restored in people who experience cortical blindness. The phenomenon, called blindsight, is proof of the brain's ability to adapt and change. Good vision depends on complex interactions between your eyes and your brain. Impulses from your retina are sent to the brain via the optic nerve. Once the brain receives the impulses, it instantly transforms them into images. Any disruption in the path the impulses follow can lead to vision issues. Vision problems can occur if the primary visual cortex (V1), located at the back of the brain, is damaged. Without a working cortex, impulses are never turned into images and blindness occurs. If damage occurs in only one part of the cortex, it's possible to retain some sight, although you might experience a blind spot in your vision. Blindsight occurs when you can respond to visual stimuli even if you aren't aware that you can see it. For example, someone who has a blind spot in their right visual field due to a V1 injury may be able to detect motion or stimuli in that area, even though they don't feel that they can see anything. In 1973, psychologists at London's National Hospital began working with D.B., a patient whose visual cortex was damaged after the removal of a brain tumor. D.B. couldn't see objects in his left visual field due to damage in the right visual cortex. The researchers wondered if D.B. might have more usable vision than he realized. They created a few tests to determine if their hunch was correct. During one of the tests, D.B. was asked to note when he saw a circle appear on a screen. Although D.B. thought the test was pointless, he agreed to try. Surprisingly, he correctly identified the position of the circles most of the time. The discovery led researchers to theorize that the brain can rewire itself if any of the structures in the brain responsible for vision are damaged. This was a huge discovery, as it was previously believed that the brain didn't possess this level of adaptability. Other tests of blindsight have taken place in the years since the first experiment occurred. in 2008, researchers wanted to find out if a man who couldn't see at all had any blindsight. A series of strokes had damaged the entire visual cortex, leaving the man blind. During the experiment, researchers filled a hallway with furniture, then asked the man to walk through it without using his cane. Despite his complete loss of vision, he was able to navigate the passage without running into a single object. Blindsight may also permit people with visual cortex damage to read expressions. Studies have shown that some people who have cortical blindness can distinguish various emotions when presented with pictures of a series of facial expressions. Not surprisingly, people who've experienced damage to their visual cortex are often desperate to regain even the smallest amount of usable vision. Vision therapy may help enhance the eye/brain connection and improve vision, even in people who have suffered severe injuries. The therapy is often used when strokes damage the primary visual cortex. Stroke patients who participated in a research project at the University Rochester correctly identified the location of a series of moving dots 80 to 90 percent of the time after practicing for months. Vision therapists use similar activities to help improve the connection between the brain and the eyes and strengthen pathways that are crucial to good vision. 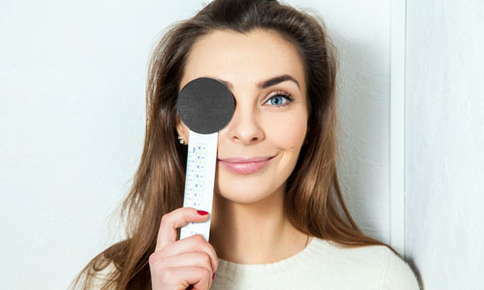 Although it may not always be possible to achieve full vision if you have cortical damage, vision therapy may help fill in the blanks in your visual field and improve your quality of life. Whether you've experienced damage to your visual cortex, or you suffer from strabismus, amblyopia, double vision, difficulty concentrating, frequent eyestrain or other issues, vision therapy can offer an effective solution for your visual problems. If you're interested in improving your vision with vision therapy, contact us to schedule an appointment.